The final stage in the metroid lifecycle is the Omega Metroid. Standing at an alarming 6 meters tall and weighing in at a little more then half a ton, the Omega Metroid is one of the most formidable Metroids to ever grace the universe. The Omega metroid is at its peak in evolution. Every system working in complete harmony with the other. It has two eye clusters, which can see in complete darkness. It's arms have a total reach of over 8 feet; usually killing it's prey with one swipe. Its tree trunk thick legs are very strong to support its weight. It has been noticed to use its claws to cling to ceilings and walls. Its tail, as thick in some segments as 4 feet in diameter, can slam against its victim, crushing and breaking bone and shell carapace alike. Omegas have a jaw crushing capacity of 3 tons p/s/i (per square inch). The Omega can generate small bursts of heat out towards it's prey, sometimes measured at up to 900 degrees. The source of this and how the Omega accomplishes this is still unknown to scientists. 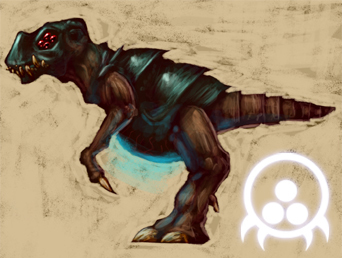 Omegas are a select breed of metroid. They are special in the fact that they are only noted to live in the lowest levels of SR388. They have been known to be near a queen's lair. It is believed that the Omegas are the "royal guards" and personal assistants to the queen. 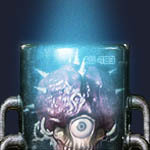 Due to the Omega's immense brain cavity, they are able to communicate to the queen and one another through telepathy. 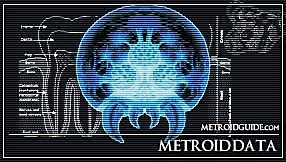 Due to the amount of resources taken to evolve, there are very few Omega Metroids in the metroid society.